Title The / Holy Bible, / Translated From The / Latin Vulgat: / Diligently Compared / With the Hebrew, Greek, and Other Editions in Divers Languages. / The / Old Testament, / First Published By / The English College at Doway, A.D. 1609. 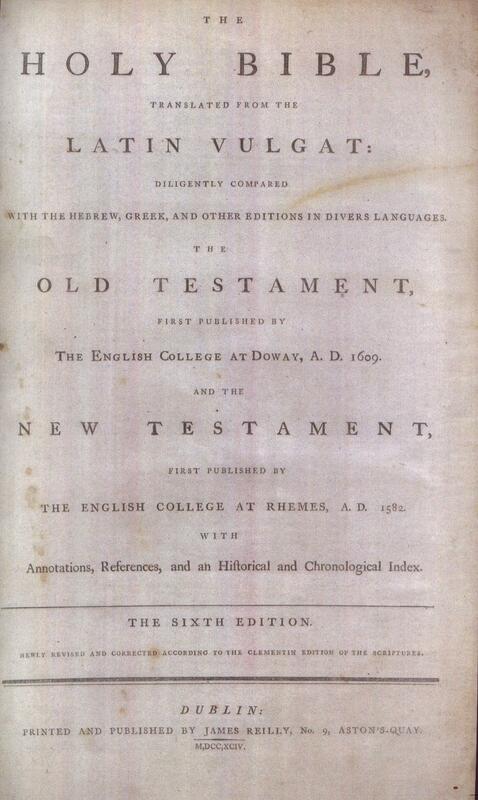 / And the / New Testament, First Published By / The English College at Rhemes, A.D. 1582. / With / Annotations, References, and an Historical and Chronological Index. / The Fifth Edition. / Newly Revised and Corrected According to the Clementin Edition of the Scriptures. / Dublin: / Printed by Hugh Fitzpatrick, / For Richard Cross, No. 28, Bridge Street. / M.DCC.XCI. Contents The complete Bible in the Douay Rheims text as revised by Richard Challoner (1691-1781) and further revised by Bernard MacMahon (1736?-1816). Comments The first complete Bible containing the Challoner-MacMahon revised text. This text would be used by many different publishers on both sides of the Atlantic through the next century. It would be the text used by the long running series of Haydock Bibles. Value A copy of this edition sold on Ebay for $665.75 on August 16, 2007. Title The / Holy Bible / Translated from the / Latin Vulgat: / Diligently Compared / With the Hebrew, Greek, and Other Editions in Divers Languages. / The / Old Testament, / First Published By / The English College at Doway, A.D. 1609. 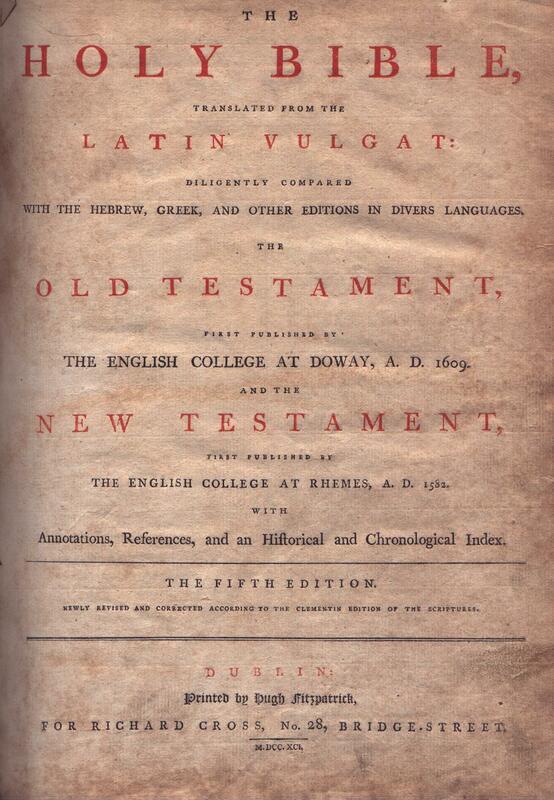 / And the / New Testament, / First Published By / The English College at Rhemes, A.D. 1582. / With / Annotations, References, and an Historical and Chronological Index. / The Sixth Edition. / Newly Revised and Corrected According to the Clementin Edition of the Scriptures. / Dublin: / Printed and Published by James Reilly, No. 9, Ashton's-Quay / M,DCC,XCIV. Contents The complete Bible containing the Challoner-MacMahon revised text. References HERBERT 1385, POPE 669-22, COTTON 204, CHAMBERLIN 18. 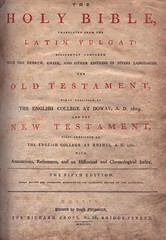 Comments The first complete English language Catholic Bible to be published in a single volume folio. 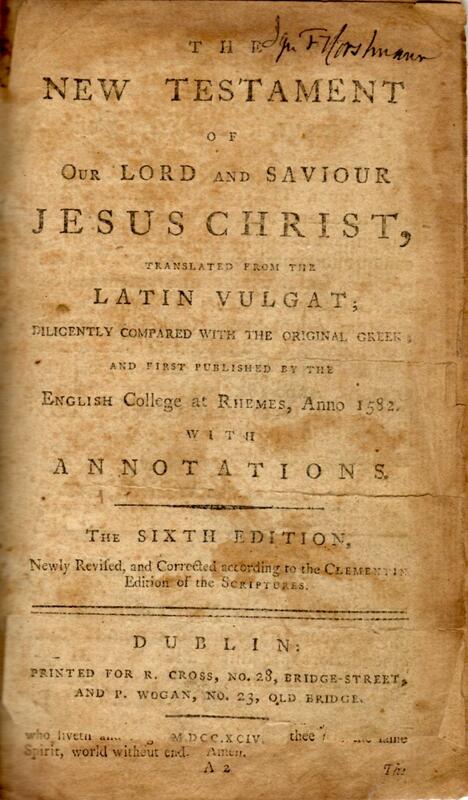 Title The / New Testament / of / Our Lord and Saviour / Jesus Christ, / Translated from the / Latin Vulgat, / Diligently Compared with the Original Greek; / and First Published by the / English College at Rhemes, Anno 1582. / with / Annotations. / The Sixth Edition, / Newly Revised and Corrected According to the Clementin / Edition of the Scriptures. / Dublin: / Printed for R. Cross, NO. 28, Bridge Street, and P. Wogan, No. 23, Old Bridge, / 1794. Contents The New Testament according to the Rheims Version as revised by Challoner and later by MacMahon. References Bible Review Journal; Fall 2017; Blom et al, English Catholic Books 1701-1800, No. 1959. Comments Scarce edition not noted in HERBERT, POPE or COTTON. See BLOM. A separate New Testament in 12mo. issued in the same year as the folio Bible (supra).